The money was in a zip lock sandwich bag when I first saw it. It wasn't neatly folded, but crumpled and puffy. He opened the bag and carefully tried to straighten out the green, wrinkled bills. When he had them somewhat flattened, he counted them several times, just to be sure, and he put them on the corner of the table where he was sitting. There was $68.00 in all. The little girl that had given him the bag wanted him to take it and with the money she wanted him to build her mother a locket. For a thirteen year old, $68.00 is a lot of money, and when she gave him all she possessed, she was thinking only of her mom's upcoming birthday and how much her mother meant to her. It wasn't a plastic bag filled with wadded bills, it was her heart she was entrusting him with. I sat near him as he and the girl texted and talked, deciding on just the perfect gift. 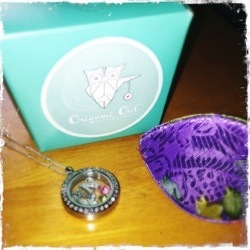 She chose a silver glass locket with a delicate silver chain, and she picked out several charms to put inside. I watched as he carefully searched through the charms, with a long pair of tweezers, looking for the perfect pieces. He found the charms she wanted, a birthday cake, a red heart with the word "Mom" on it, a silver medical symbol, a silver flower and a gold heart covered with tiny crystals. He carefully opened the locket and, with the hands of a surgeon, placed each charm inside. He knew he was making something very special for someone and he used a delicate touch as he completed the locket. He gently closed it, wiped the glass clean from any trace of fingerprints, and put it on a cloth as he decided on the packaging she might like. "I think she said her mom likes purple. I'll put in the purple fortune cookie." The lockets come with packaging that's shaped like fortune cookies. They're covered with colorful fabric from silk kimonos, and make for cute, unusual holders for the lockets. He opened the purple silk fortune cookie and slid the necklace, hand made with love, inside. He then grabbed one of the small, blue boxes, fashioned after a Chinese take-out box, and placed the fortune cookie in it. He furrowed his brow as he carefully closed the tabs on the box. Then the business man in him came out. He slipped one of our business cards into the side of the box, grabbed a catalogue that shows the full line of lockets, charms, chains and more, and put them lovingly in his backpack along with her baggy containing her change, a five dollar bill. After he made sure the girl's gift was secure, he grabbed a stack of business cards, a dozen catalogues, and with a grin said, "I'm handing these out to my teachers tomorrow." I couldn't help but smile thinking that the child, that has been traumatized time after time, might have found a reason to smile once again. He has a goal, he's saving for medical school. His mind might change regarding his profession, but he has a goal, and, hopefully, something to take his mind off of the past. And here's our Facebook page, https://www.facebook.com/jakobandteri?ref=hl If you're up to it, encourage him with a "like." Teri he is gonna be quite the businessman. I am so glad he is loving the work and learning so much from it. We need more kids like him today in the world. Nice story. I'll check the links later for sure. I love this, thanks, you made my day. Beautiful story Diva, it sounds like so much work went into this because this man knew how important a gift it was set to be, really makes me smile. I'll definitely check out the site. Such a beautiful story. Sounds like a bright future is on the horizon. The story touched my heart. Good for you -- the name of this blog. I love it. I have had type 1 diabetes for 23 years so I understand about managing stuff that we get stuck with. Samson, our Samoyed and I have these conversations every now and then on my blog. The rest of it is a little bit of everything. Thanks for following us, I'm now following yours as well. Thank you Inger. Yes, my grandson has a giving, caring heart. He's a sweet one.